If professional sports are more up your alley, Erie has something to offer all year round. Jerry Uht Park is home to the Erie SeaWolves professional baseball team. If football is your preference, the Erie Explosion offers the indoor arena version of the game. Partial to basketball or hockey? Then the Erie Bayhawks and Erie Otters are just the ticket. The Erie Zoo and Botanical Gardens is another local gem. Home to over 400 animals representing 100 different species, the zoo is open March 1 through November 30. The zoo also offers a variety of beautiful botanical gardens, many of which are designed to create a natural habitat for the park’s residents. Visitors encounter everything from large leaf tropical plants to Porcupine and Prairie Sky Switch wild grasses on a journey through the zoo and its gardens. Feeling lucky? A visit to Presque Isle Downs and Casino may be in order. Feeling cultural? Check out an Erie Philharmonic performance or an Erie Playhouse show. No matter your tastes, Erie offers something to satisfy your palate. 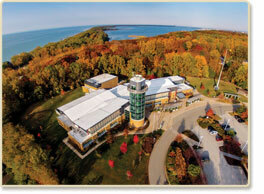 The gateway to Presque Isle, Tom Ridge Environmental Center, invites tourists to learn more about Erie’s #1 tourist attraction. TREC educates visitors about the history of the Park and its 3,200 acres of diverse plant and animal life. 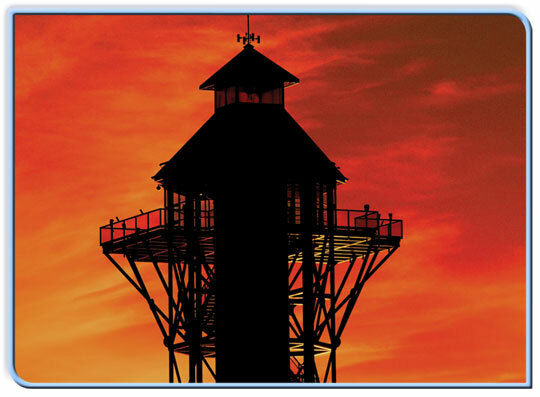 A view from the top of the tower is a treat for tourists and locals alike. The bayfront has undergone amazing changes in recent years becoming a major attraction for tourists. Erie’s Bayfront Convention Center, Liberty Park Amphitheatre, and a variety of hotels and restaurants draw visitors back again and again. And there is no better spot to catch a sunset. 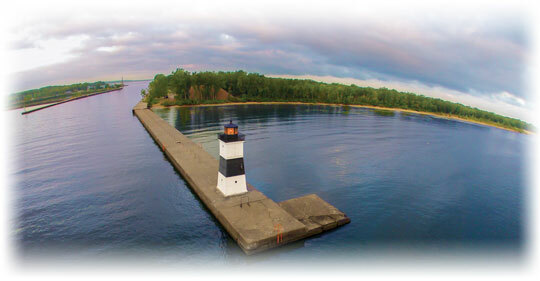 Offering seven miles of sandy beaches on 3,200 acres – is Erie tourism’s star attraction, Presque Isle State Park. An average of four million visitors a year come to the park to enjoy water sports such as boating, swimming, fishing, and kayaking. With 21 miles of trails, hiking, in-line skating, running, and cycling are also popular. Named one of the top birding spots in the country by Birder’s World magazine, Presque Isle State Park draws bird watchers from near and far in search of over 320 species of birds.